Armchair with hardwood frame covered with expanded foam and polyester fiber. Cushions in foam and down. Upholstery options are leather or removable fabric slip cover. Three seat sofa with hardwood frame covered with expanded foam and polyester fiber. Cushions in foam and down. Upholstery options are leather or removable fabric slip cover. AN81/82/83: This armchair, and the related two and three-seat couches, known as "Tuxedo", owe their name to Tuxedo Park, an elegant and exclusive holiday resort near Tuxedo Lake, New York, which represented a reference point for the elegance of the time. Armchair with hardwood frame covered with expanded foam and polyester fiber. Cushions in foam and down, available also in foam only. Removable fabric slip cover. Two seat sofa with hardwood frame covered with expanded foam and polyester fiber. Cushions in foam and down, available also in foam only. Removable fabric slip cover. Available with fold-out bed option with beech wood slat and foam mattress. AN91/92/93: This model, is the result of the slow evolution of a type probably created after the First World War, which towards the mid-1920s became well known and highly appreciated. The characteristic volume of the armrest is the stylization of the richer and more decorated motif that characterized the 19th century sofas. Two seat sofa with hardwood frame covered with expanded foam. Not removable upholstery velvet. Armchair with hardwood frame covered with expanded foam. Not removable upholstery velvet. 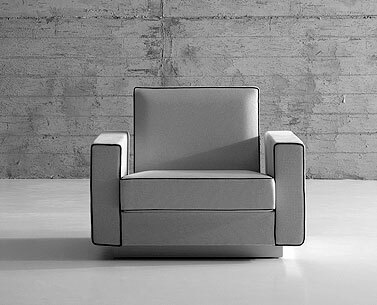 Three-leg armchair with metal frame covered with expanded foam. Not removable covering in fabric..
CH62/71: The sofa was used for the interiors of the set of Marcel L'Herbier’s film "L'inhumaine" in 1923 by Alberto Cavalcanti, and for that of the film "Le Vertige" in 1925. It became one of the objects characterizing the Maison de Verre’s interior, designed to be the home and office of Dr. Dulsace in Paris from 1928 to 1932. The structure was originally covered in velvet and stuffings were covered in leather or tapestries; this couch represents the modern version of the French 19th century "canapé à confident", since, with its round sides, it invites the two sitting persons to converse looking directly at one another. The armchair was used for the small blue room of the Maison de Verre. ARABESK: Originally the structure was made of a wooden framework carved by hand, filled up from foam rubber panels and covered with fabric. The re-edition is manufactured with an injection of expanded foam on a metal loom. The project, from which has been developed a version with two places, issue from the tridimensional unrolling of a leaf, that interlaces and models itself until it reduce itself in correspondence of the three feet. Arabesk is exposed at Vitra Museum. Tubular steel chaise, frame in epoxy enamel or polished chrome. Base in sheet and tubular steel with black epoxy finish. Headrest in leather. Pad in leather or cowhide. The chaise longue was initially produced by Thonet France and from 1930 onwards by Embru in Switzerland. 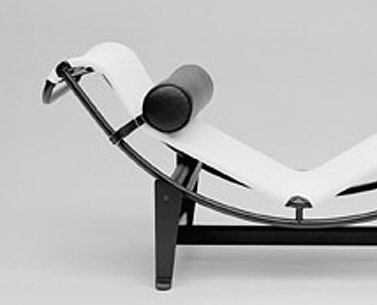 In 1959, Heidi Weber re-interpreted the chaise longue together with other Le Corbusier’s designs with the direct collaboration of the designer himself. Club chair with tubular steel frame in epoxy enamel or polished chrome. Removable cushions in foam and down. Upholstery in leather or fabric. 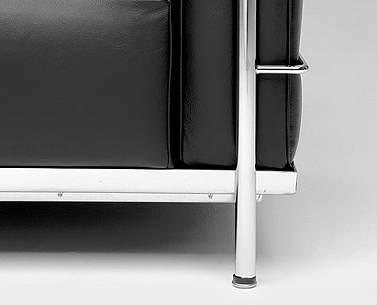 Tubular steel chaise, frame in epoxy enamel or polished chrome. Base in sheet and tubular steel with black epoxy finish. Headrest and footrest in leather. Seat with heavy canvas stretched over chaise frame. The self-supporting canvas version comes after the one with the leather or pony mattress and could have been introduced on the suggestion of the first manufacturer, Thonet. Two seat sofa with tubular steel frame in epoxy enamel or polished chrome. Removable cushions in foam and down. Upholstery in leather or fabric. CO21/22/23: Faithful to the aspect of the original prototype of the Grand Modèle of Grand Confort, it underlines the contrast between the softness of the feather seat and the rigidity of the metal structure. The construction of the prototype certainly had handicraft characteristics, which only after 1959 could be adapted to the requirements of large-scale production. 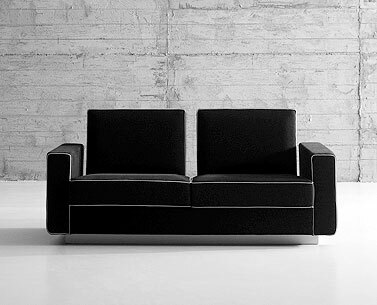 The two and three-seater models based on the design of the Grand Confort cannot in actual fact be attributed to Le Corbusier, who had conceived an armchair suited to satisfy the physical standard of an individual, and had refused Heidi Weber’s request to extend the original design to a sofa. It was not until the end of the 1960s that the first models of sofas inspired by the Grand Confort appeared on the market. Three seat sofa with tubular steel frame in epoxy enamel or polished chrome. Removable cushions in foam and down. Upholstery in leather or fabric. Club chair with tubular steel frame in epoxy enamel or polished chrome. Cushions in expanded foam and polyester fiber. Upholstery in leather or fabric. Two seat sofa with tubular steel frame in epoxy enamel or polished chrome. Cushions in expanded foam and polyester fiber. Upholstery in leather or fabric. CO31/32/33: In line with the research characterizing the whole experience of Le Corbusier as a designer, and notably with the theme of the proportions codified in the Modulor, this small version of the Grand Confort series was conceived for the man who generally sits upright, with his legs apart. 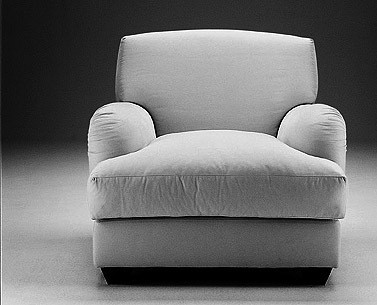 Grand Confort was not manufactured in 1929 and the known prototypes were characterized by a spring mechanism that bent the armchair backwards when used. This mechanism was eliminated in the new editions from 1959 by Heidi Weber who, in agreement with Le Corbusier, also made other modifications, including the cushions’ shape and the assembly characteristics. Also for this model the two and three-seater versions cannot be attributed to Le Corbusier. Club chair with tubular steel frame in epoxy enamel or polished chrome. Cushions in expanded foam and polyester fiber. Removable upholstery in leather or fabric. Two seat sofa with tubular steel frame in epoxy enamel or polished chrome. Cushions in expanded foam and polyester fiber. Removable upholstery in leather or fabric. This large version of Grand Confort was conceived for women, who tend to sit with their legs crossed and in a transversal line. It was presented for the first time in 1959 by Heidi Weber in Zurich. Also for this model the two and three-seater versions cannot be attributed to Le Corbusier. Armchair with wooden structure lined with foam and chrome plated steel tube base. Different density foam cushions covered with not removable leather or fabric squares. Three-seat sofa with wooden structure lined with foam and chrome plated steel tube base. Different density foam cushions covered with not removable leather or fabric squares. FL21/22/23: As Knoll Associates Planning Unit Director, Florence Schust Knoll Basset produced and distributed furnishings designed by the greatest masters of contemporary design; meanwhile she developed some projects of her own, such as the “lounge collection” of 1954, shown here. Armchair with hardwood frame covered with expanded foam and polyester fiber. Cushions in foam and down. Not removable upholstery in leather. Two-seat sofa with hardwood frame covered with expanded foam and polyester fiber. Cushions in foam and down. Not removable upholstery in leather. 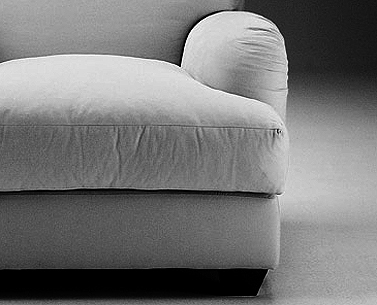 FR01/02: This armchair is the derivation of a model designed by Frank for Madame Cerf’s apartment. The armchair with the arched back was widespread in the 1930s but Frank’s version stands out for some characterizations: the arch of the back which is laid in the centre of the armrest and does not embrace the whole rear part of the chair and the shape of the armrests which are neither inclined nor tapered. The sofa is simply a two-seat derivation of the armchair. Two-seat sofa with hardwood frame covered with expanded foam and polyester fiber. Cushions in foam and down. Upholstery options are leather or removable fabric slip cover. Two seat sofa with hardwood frame covered with expanded foam, polyester and cotton fiber. Cushions in mixed foam and down. This couch is portrayed in the living-room of Georges Born’s apartment in Buenos Aires, one of Frank’s most important interior decoration designs. FR11/12/13: Couches and armchairs similar to this one characterized the interiors of middle-class homes from the beginning of the 20th century to the end of the 1920s. In his activity as interior decorator, a relatively new profession and quite distinct from that of architect, Frank himself did not claim the authorship of the furniture he was using in his work, although he used it freely, reworking proportions, inclinations and other construction details. The fact remains that through his works he was able to exert an incisive influence on the taste of the period, and that his reinterpretation of pre-existing objects characterized them to the extent of making them seem his own. Not being destined to mass-production, Frank’s designs are known through the photographs of the interiors he decorated. The sofas are simply a two and three-seat derivation of the armchair. Armchair with hardwood frame covered with expanded foam and polyester fiber. Cushions in down. Removable fabric slip cover. FR92: Two-seat sofa with hardwood frame covered with expanded foam and polyester fiber. Cushions in down. Removable fabric slip cover. FR91/92/93: A re-interpretation of the model used by Frank for the interior decoration of Jean Pierre Guerlain’s home. Although deriving from the stylization of a model produced in the years after the First World War, Frank’s personalization gives it a strong characterization, recognizable in the geometry of the pyramidal feet, too. The sofas are simply a two and three-seat derivation of the armchair. Armchair with frame in lacquered wood. Not removable seat and back upholstered and covered in leather. Hardware in chromed or gold-plated brass. Available also with frame in visible, transparent lacquered birch plywood. This deck chair too was used to furnish the lounge of Villa E 1027. 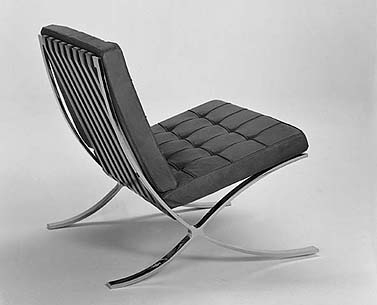 The design of the deck chair was registered by Eileen Gray and Jean Badovici in 1927 under the name "Transat". Armchair with curved hardwood frame covered with expanded foam. Base in chrome plated tubular steel. Not removable upholstery in leather. This model is linked with the work for Suzanne Talbot in Rue de Lota, where it appeared for the first time. Its nickname "Bibendum" was given by the designer herself after the appearance of the character in Michelin’s advertisements. GR23: The turning-point of Eileen Gray's formal and expressive languages is generally considered the work that the fashion designer Suzanne Talbot, pseudonym of Madame Mathieu Lévy, commissioned her for the Parisian apartment in Rue de Lota. Beginning from this project indeed, her new and more austere language took progressively shape and emancipated her from the Deco. Three seat sofa with hardwood frame lined with expanded foam and covered with polyester. Down filled seating and cushions. Side cases in MDF lacquered in black polished to a high gloss finish. Not removable upholtery in leather. Available also with removable covering in fabric. Armchair with hardwood frame covered with expanded foam. Not removable upholstery in velvet with striped piping. Two-seat sofa with hardwood frame covered with expanded foam. Not removable upholstery in velvet with striped piping. HO21/22/23: The armchair was designed for the living room of “Haus Kohler” in 1911. It represents an iteraton of a model previously designed for the Palais Stoclet’s vestibule in Brussels (1905-1911). In that case, the armchair also rested on wooden feet, but presented a more moderate use of the decorative border. The two and the three-seater sofas are simply derivations of the armchair. Armchair with hardwood frame covered with expanded foam. Not removable covering in stitched leather squares. Two-seat sofa with hardwood frame covered with expanded foam. Not removable covering in stitched leather squares. HO31/32/33: Wrongly attributed by some journalists of the period to Otto Prutscher, Hoffmann’s pupil and co-founder of the Wiener Werkstätte, this armchair was produced and presented at the international exhibition held in Buenos Aires in 1910 on the centennial of Argentinean independence (la Revolución de Mayo). The designer’s preference for geometric compositions modulated on the square is well known and is characteristic of his most important architectural designs. For this reason his formal language was ironically renamed “Quadratstil". The sofas are simply a two and three-seat derivation of the armchair. Armchair with hardwood frame and metal reiforced back lined with expanded foam and covered in cotton fabric. Cushions in foam covered in cotton fabric. Upholstery options are leather or removable fabric slip cover. Feet in Italian nut with beeswax finish. Two-seat sofa with hardwood frame and metal reiforced back lined with expanded foam and covered in cotton fabric. Cushions in foam covered in cotton fabric. Upholstery options are leather or removable fabric slip cover. Feet in Italian nut with beeswax finish. LE81/82/83: Considered by some critics as a designer inspired by the more famous Ruhlmann, in his work Leleu actually developed an elegant and refined language in his work that distinguished him from his contemporaries. This armchair is the new edition of one of the most suggestive and original works by Leleu, who liked it to the point of using it several times, in Marcel L’Herbier’s film "Le parfum de la dame en noir" in 1931 and in the "Trouville" apartment on the liner “Normandie" in 1935. The sofas are simply a two and three-seat derivation of the armchair. Longue chair with frame in chrome plated tubular steel. Suspension in reinforced hide straps. Seat in expanded foam covered with leather. 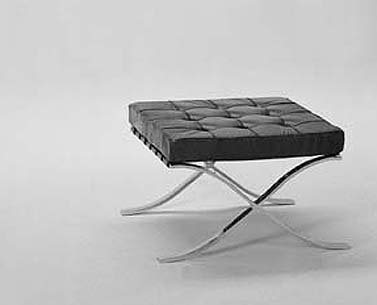 Footstool with frame in chrome plated tubular steel. Suspension in reinforced hide straps. Seat in expanded foam covered with leather. MI16/17: From an idea of Mies, developed in 1932, that aimed at reinventing the deck-chair of a ship, where it could be used by leaning its upper side against the deck’s railing. Further uses were in fact contemplated, such as hanging it from a tree branch or a ceiling hook at home. The curved base that gives form to the armrest characterizes this new edition, and is a solution present in other sketches of the same period. This chaise longue is chronologically the most recent project by Mies. It was initially produced by Bamberg Metalwerkstätten, and later by Thonet, that manufactured it with some modifications to the section, which became shorter and higher. Couch with solid hardwood walnut coloured frame and suspension in hide straps. Legs in chrome-plated tubular steel. Mattress and headrest in expanded foam and dacron covered with stitched leather squares. This model was used for the first time in 1930 in Philip Johnson’s apartment in New York and later shown to the public in 1931 at the Berlin Bau-Austellung as part of the furniture for a "bachelor’s apartment”. The technical, building and formal details are closely linked with those of the furniture for the German pavilion at the Barcelona International Exhibition of 1929.
hide straps. Seat and backrest in expanded foam lined with polyester fiber. MI34/36: This armchair, together with the stool, was designed for the Barcelona International Exhibition of 1929 for which Mies designed the German pavilion including the furniture. Two armchairs of this model were to have been used by the King and Queen of Spain during their official visit to the pavilion to sign the guest book. They were initially produced by Berliner Metallgewerbe Joseph Müller, and from 1931 by Bamberg Metalwerkstätten. 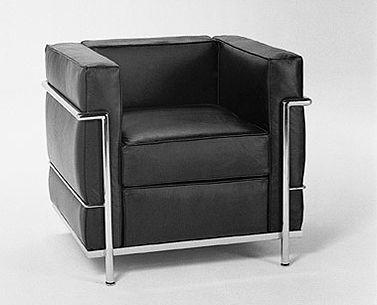 Armchair with structure in chromed square steel tube. Wooden frame lined with shaped expanded foam. Cushions in expanded foam at different densities; non removable covering in leather or fabric. 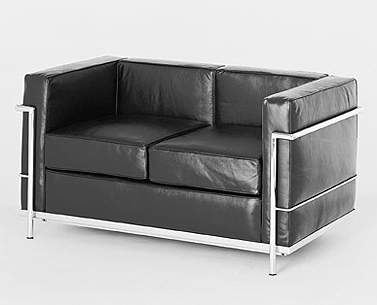 Three seat sofa with structure in chrome-plated square shaped steel tube. Wooden frame covered with shaped expanded foam. Cushions in expanded foam at different densities; not removable covering in leather. SA21/22/23: Designed for the lobbies of the General Motors Technology Centre in Warren, Michigan, the seating collection is composed of armchairs and two, three and four-seat sofas. They answered the need for representativeness Saarinen was looking for through the explicit reference to stock car seats, known for their comfort and for the quality of their upholsteries and finishes. Through these products, the technological research, which permeates the whole architectural plan, finds further opportunity for experimentation. The plan elaborates the image of an inclined seat suspended inside a three-dimensional framework, consisting of a self-supporting frame in fiberglas mechanically connected to the steel base. The difficulty of obtaining a perfectly horizontal surface through seat and armrests, along with the difficulty of making the upholsteries perfectly adhere to the frame, which presents various angles, are probably at the basis of two different series of construction designs which constitute part of Eero Saarinen’s archive, donated in 2002 to the Yale University by the studio Kevin Roche John Dinkeloo and Associates LLC. 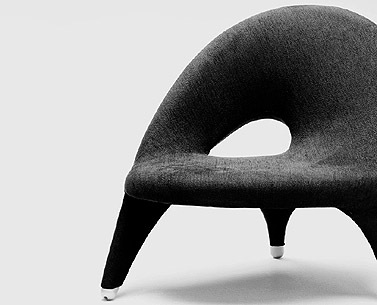 A prototype of the chair is exhibited at MOMA. Some original pieces of the seating collection, as well as some benches and tables are still present inside the buildings of the General Motors Technology Centre planned by Saarinen. These reproductions, built on the basis of the original designs and the existing pieces, are the first to be produced since the fifites’. Armchair with wooden structure, lined with foam. Different density foam cushions. Not removable upholstery in leather or fabric. Two seat sofa with wooden structure, lined with foam. Different density foam cushions. Not removable upholstery in leather or fabric. SA31/32/33/34: Conceived for the reading rooms and student lounges of the University of Chicago Law School, the single or multiple seats sofa is part of the furnishings designed by Eero Saarinen and destined to The Law School and to the Women’s Residence Halls, the two buildings which he had been commissioned to design and which both opened in 1959. Like most of Saarinen’s projects, the design develops around one central theme which, in this case, is the separation of the sofa’s backs. Three seat sofa with wooden structure, lined with foam. Different density foam cushions. Not removable upholstery in leather or fabric. Four seat sofa with wooden structure, lined with foam. Different density foam cushions. Not removable upholstery in leather or fabric.